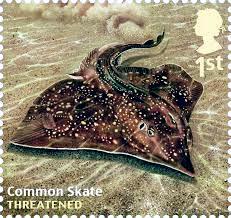 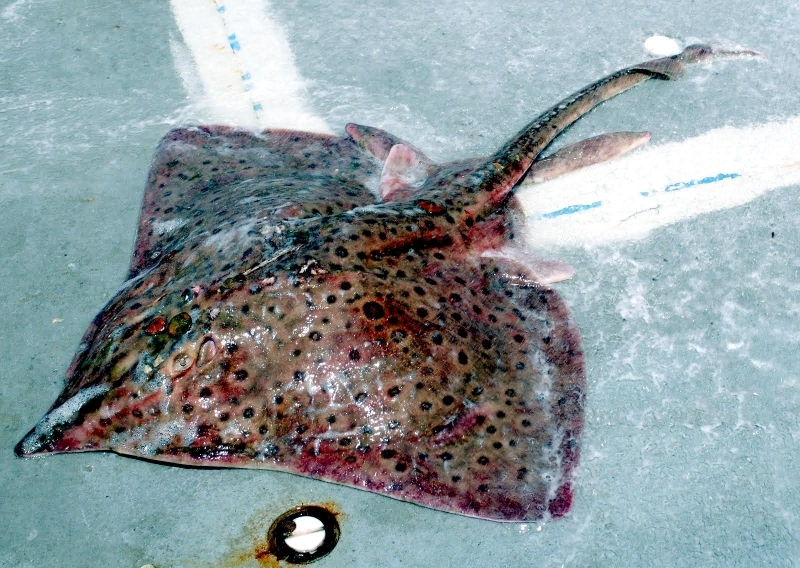 The Common Skate is now a rare species throughout most of its range and has become extinct in some regions. 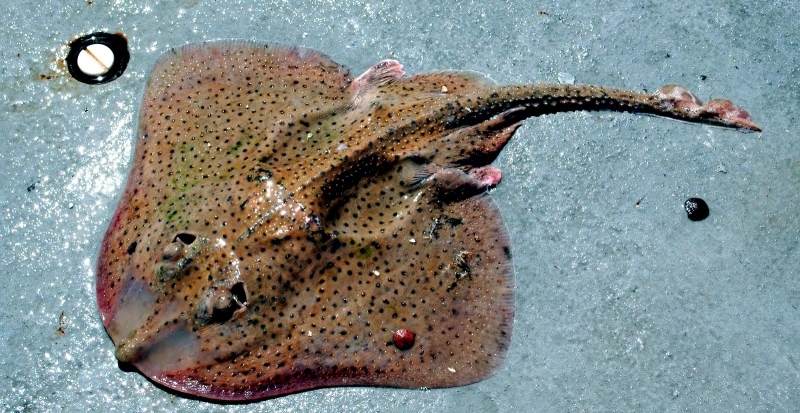 Sadly, there is no longer anything common about the Common Skate. 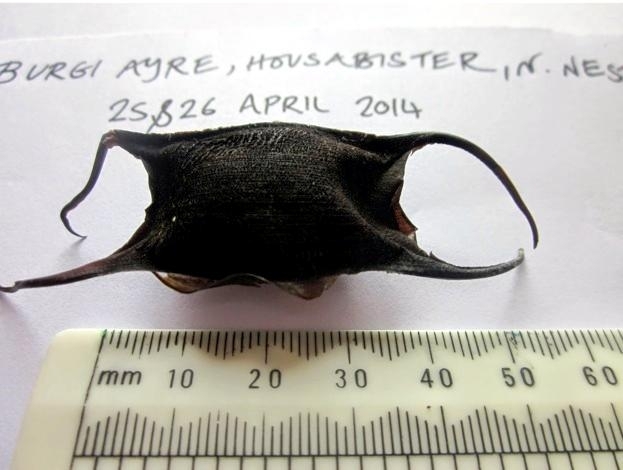 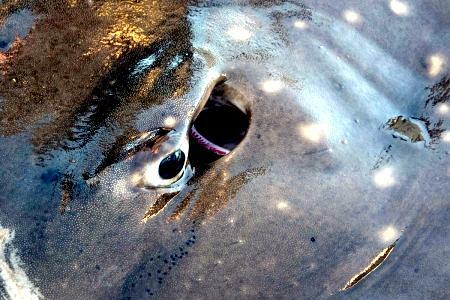 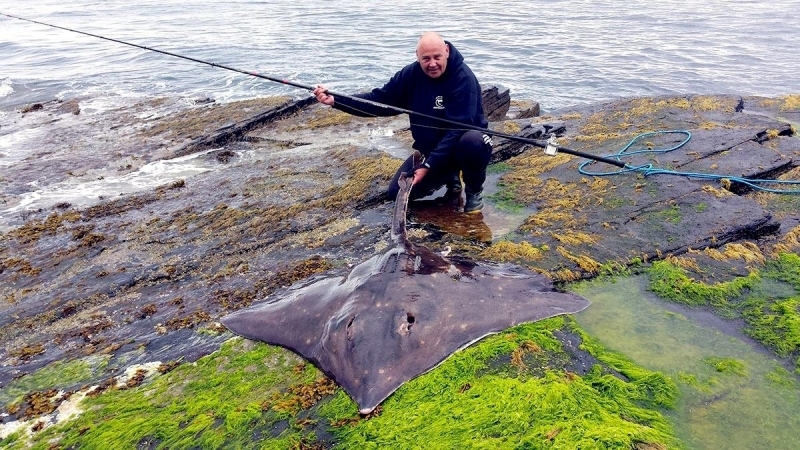 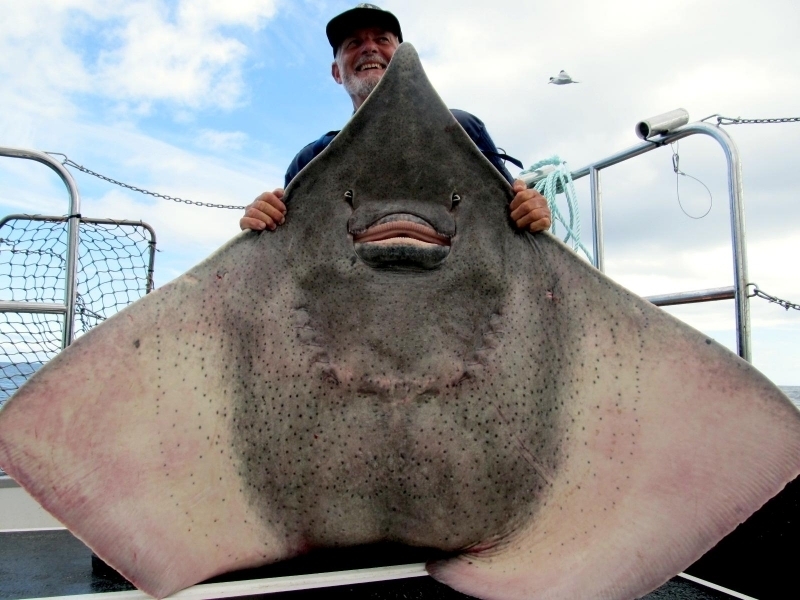 Once abundant, this “Manta Ray of the North” has become very rare. 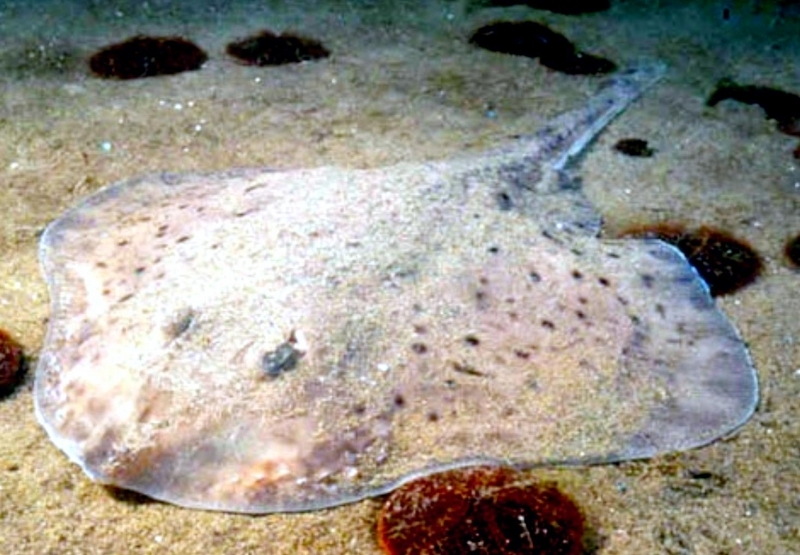 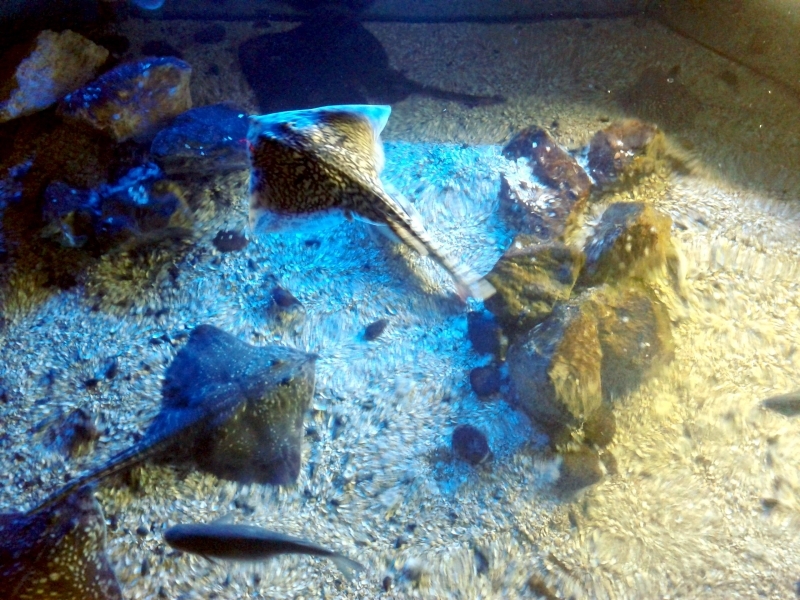 Common Skates belong to the Rajidae family which includes skates & rays. 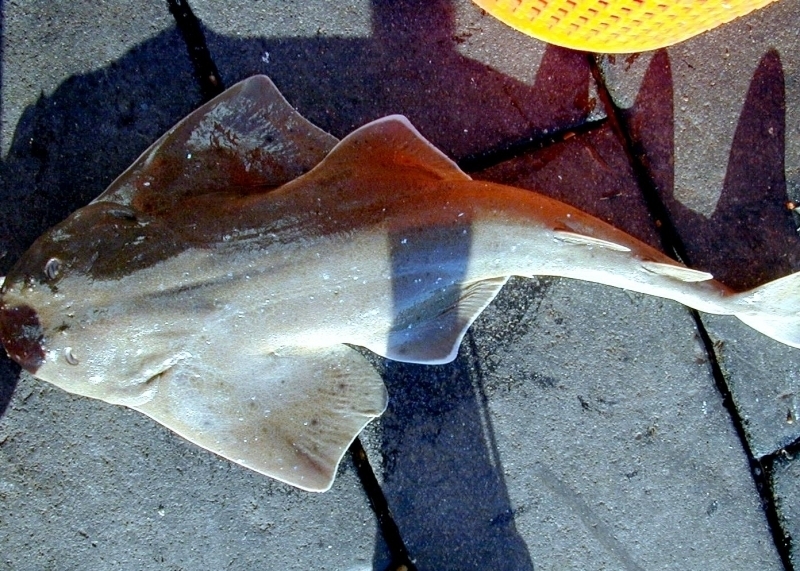 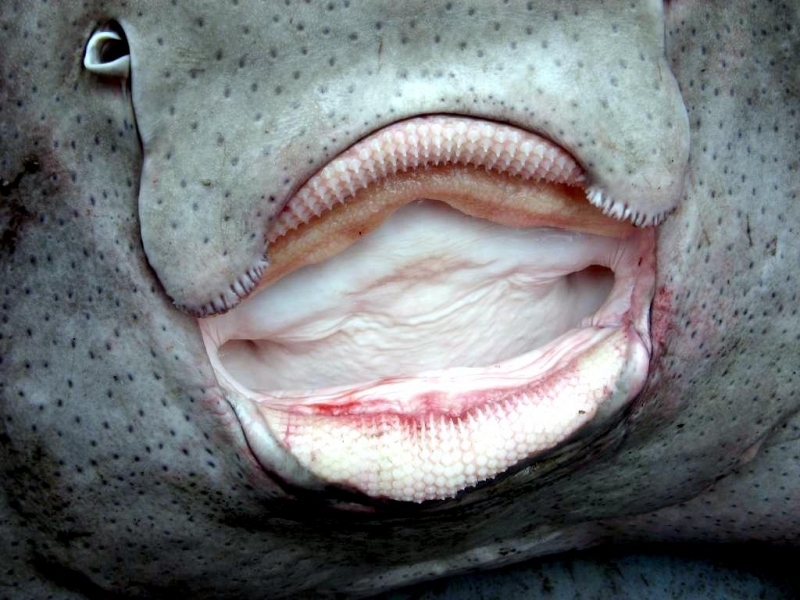 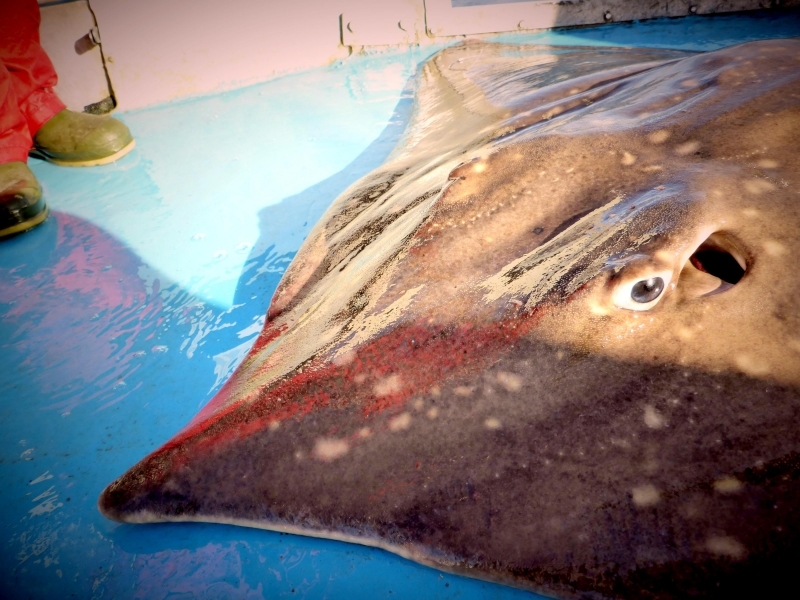 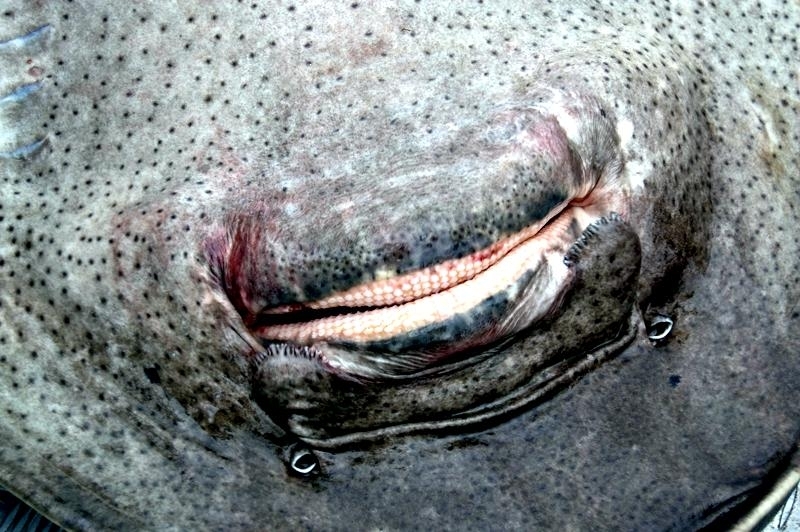 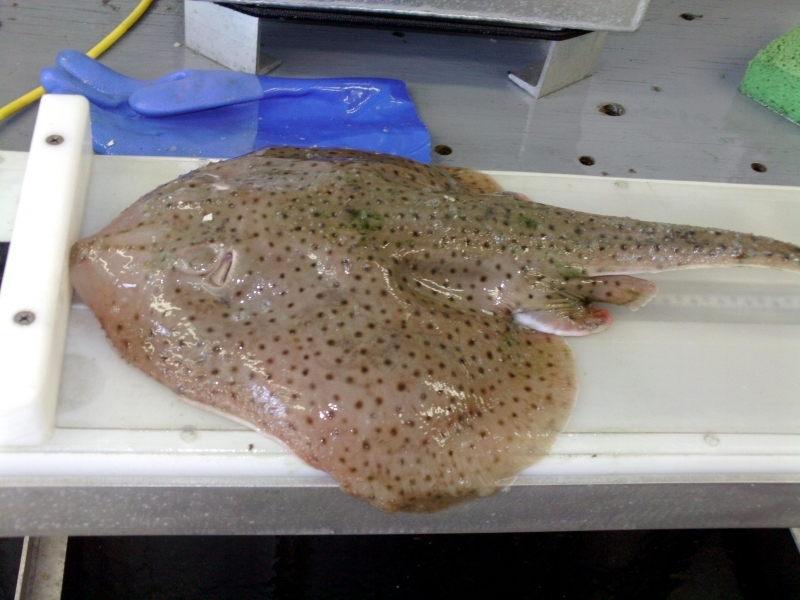 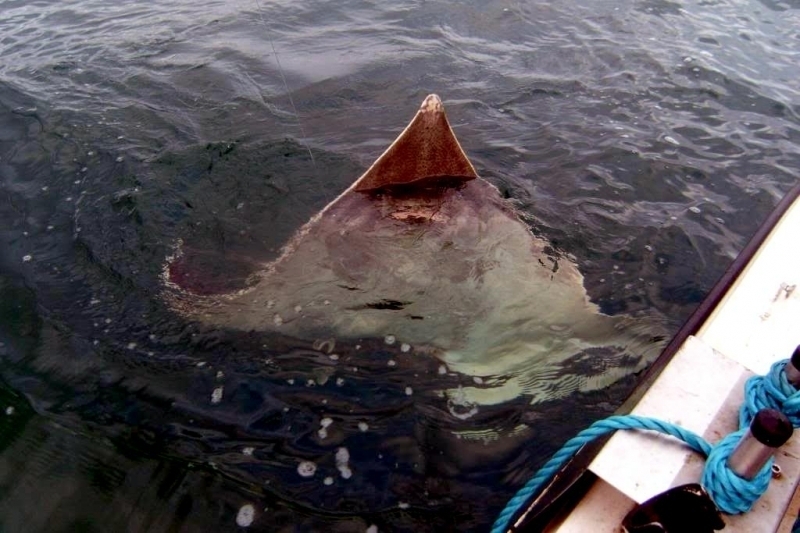 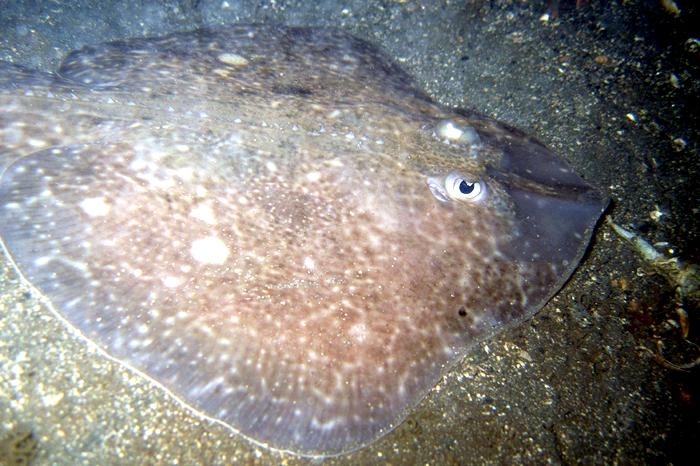 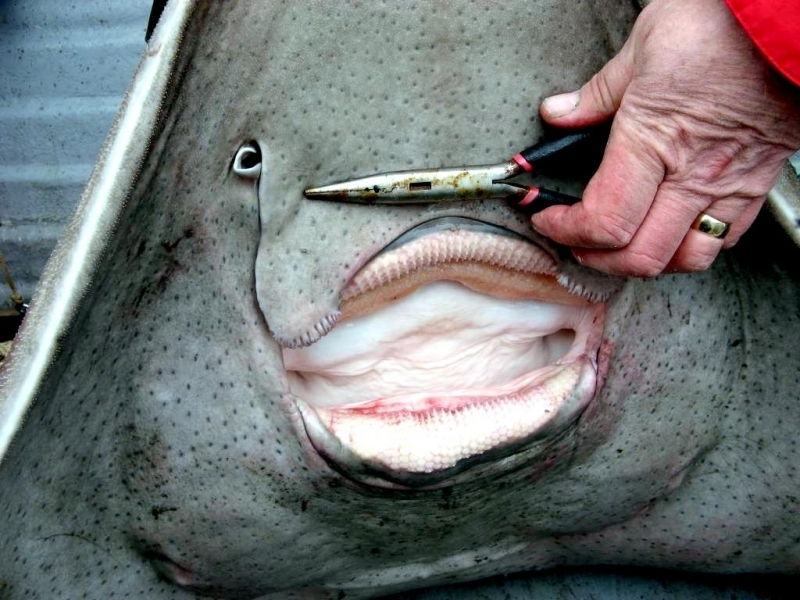 The Common Skate is the largest batoid fish (flat elasmobranch fish with the pectoral fins fused to the sides of the head). 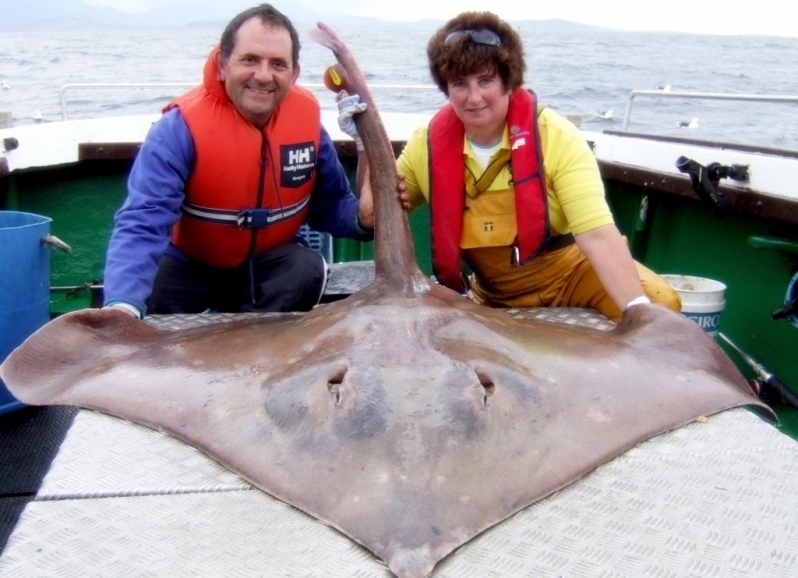 Females can reach lengths of about 280 centimeters and males about 200 centimeters. 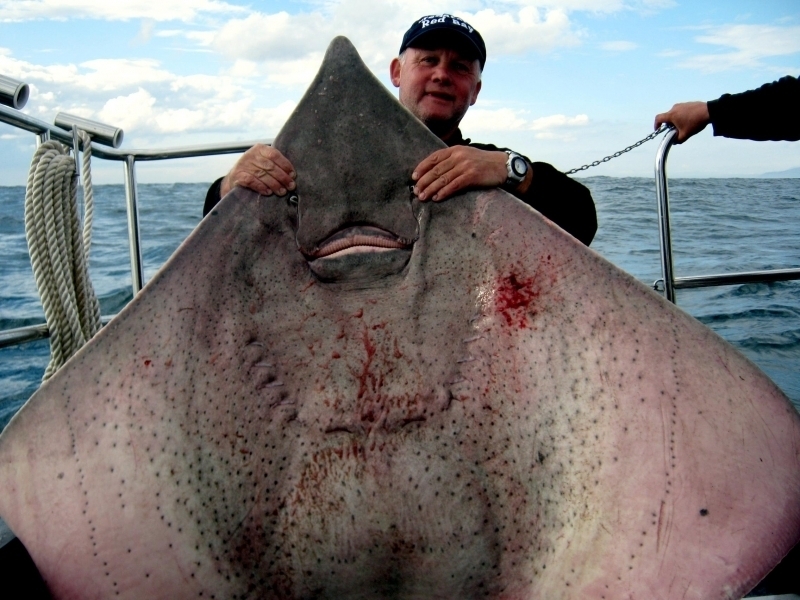 Males mature at a length of about 125 centimeters and females at about 180 centimeters (both at over 10 years old). 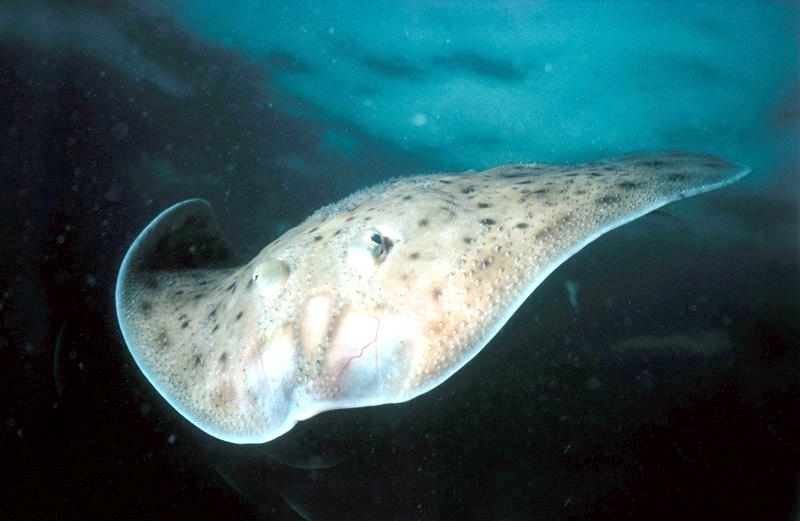 The species can live from 20 up to 100 years. 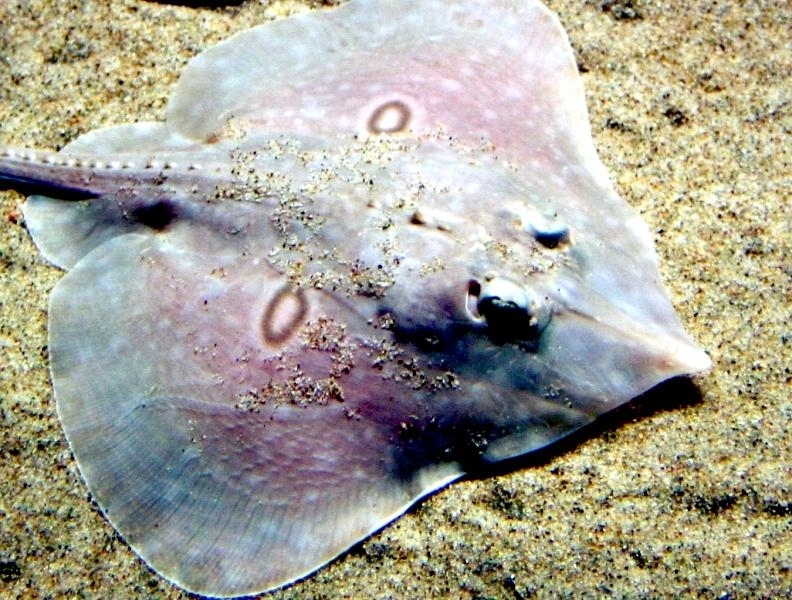 The Common Skate’s snout is long & pointed and the front margin of the wings is strongly concave, giving this skate an overall angular shape. 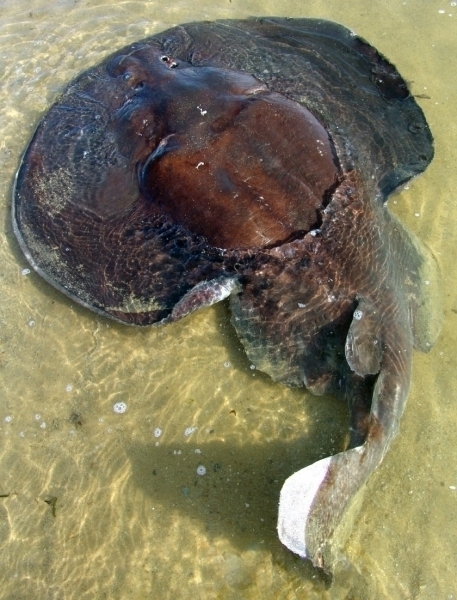 Its tail has a row of spines along its length but unlike the large stinging spine of stingrays, these are not venomous. 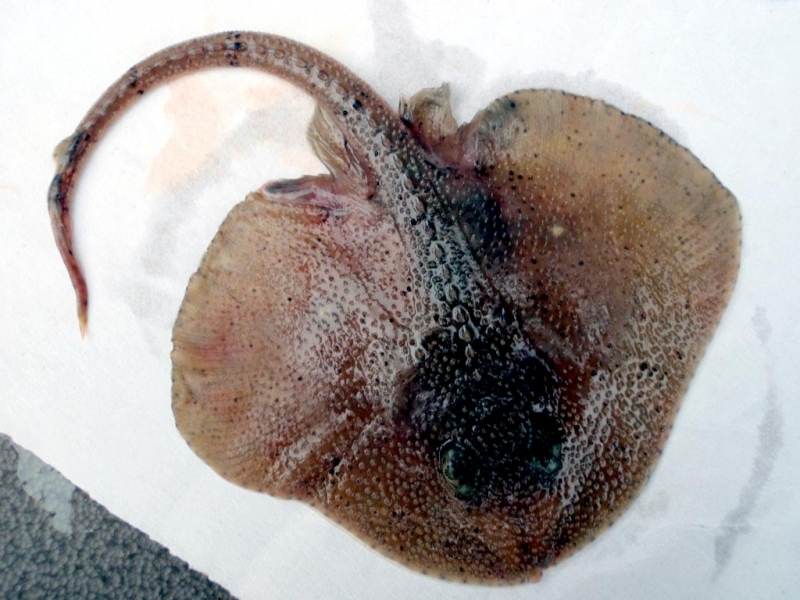 The Common Skate is sometimes called the Blue Skate because its underside is bluish gray. 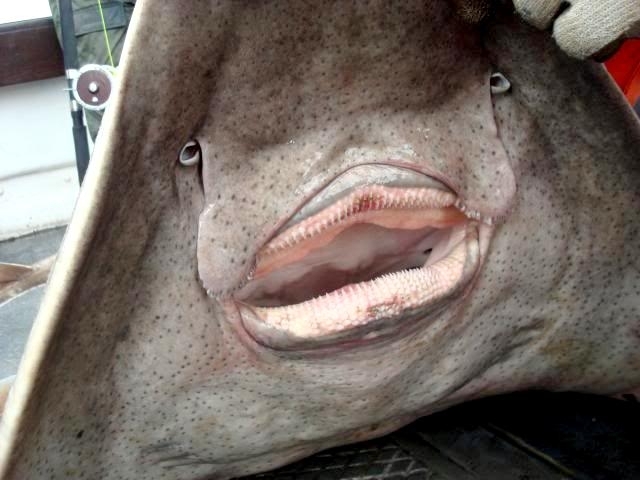 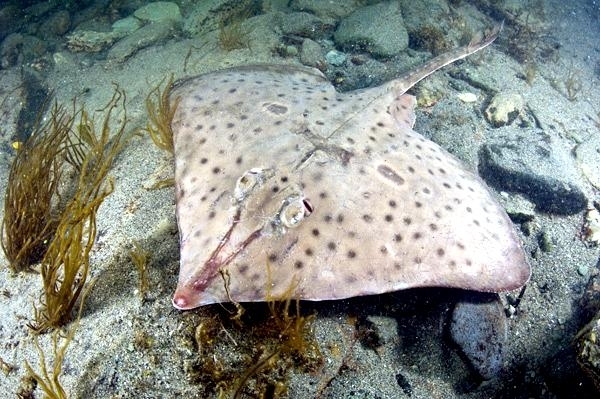 It can swim strongly and feeds on fish in mid-water as well as hunting over the seabed for crabs, lobsters, bottom-dwelling fish and other rays. 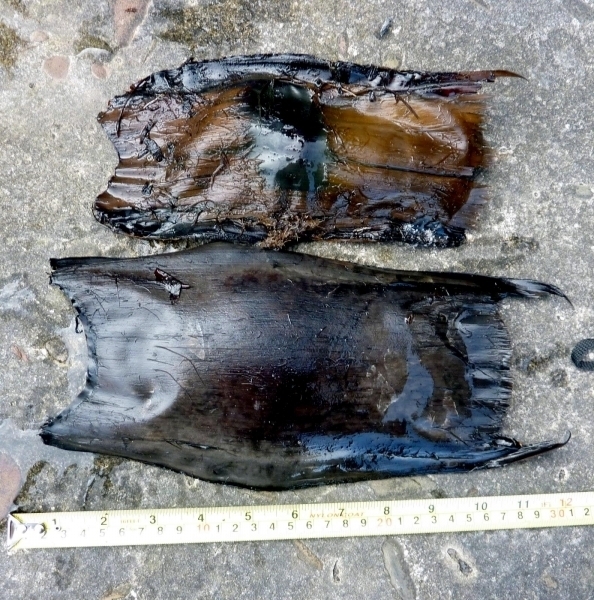 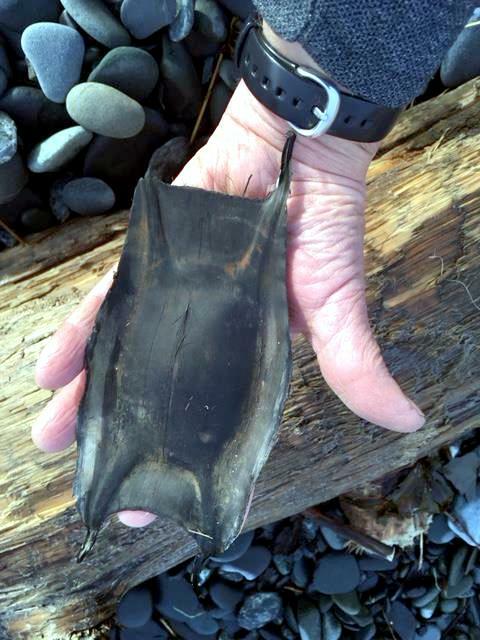 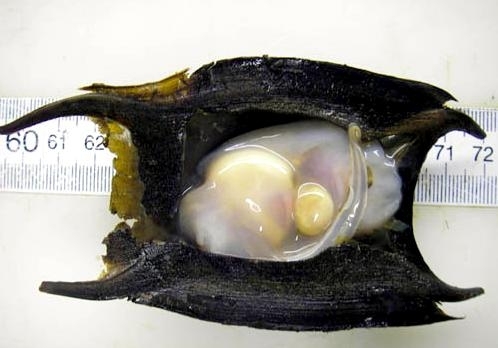 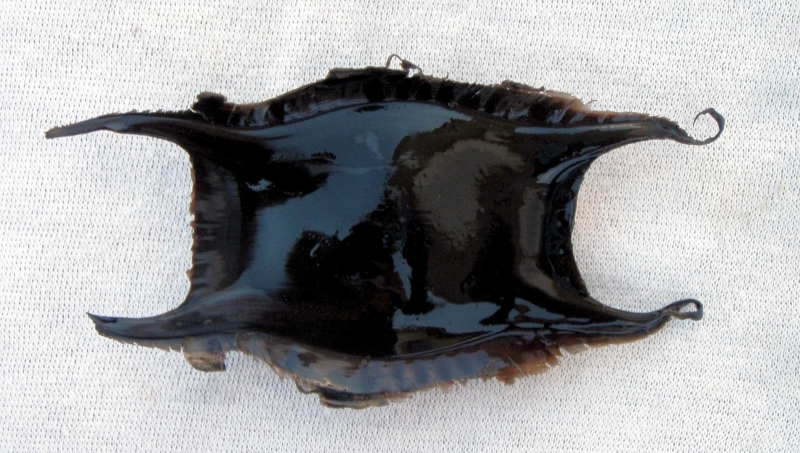 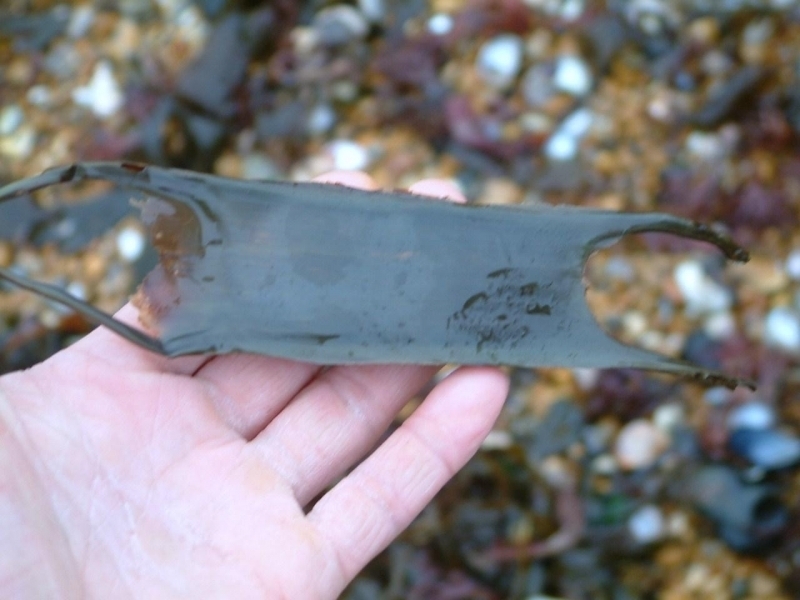 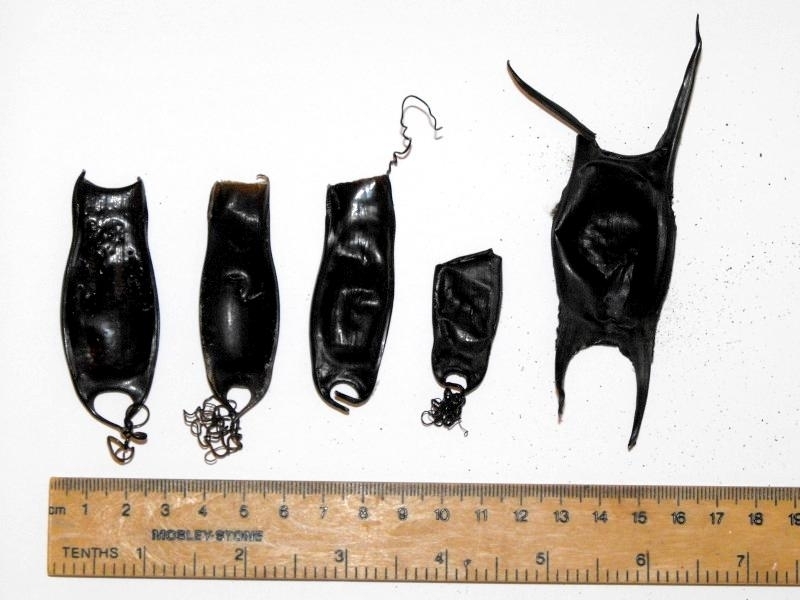 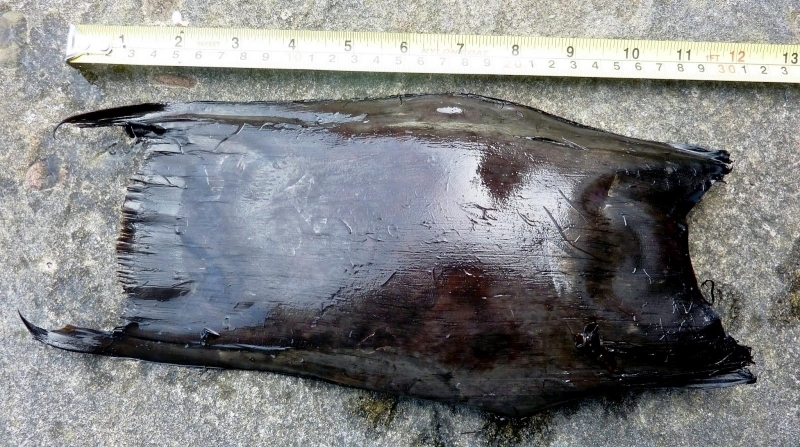 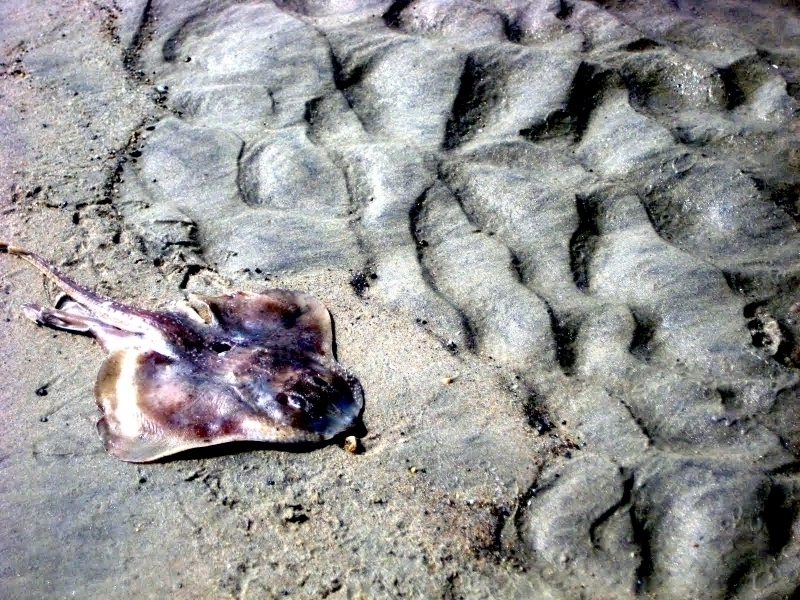 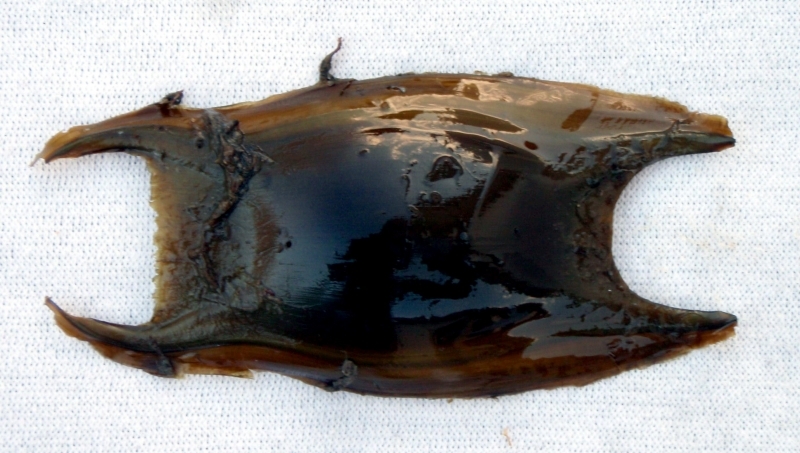 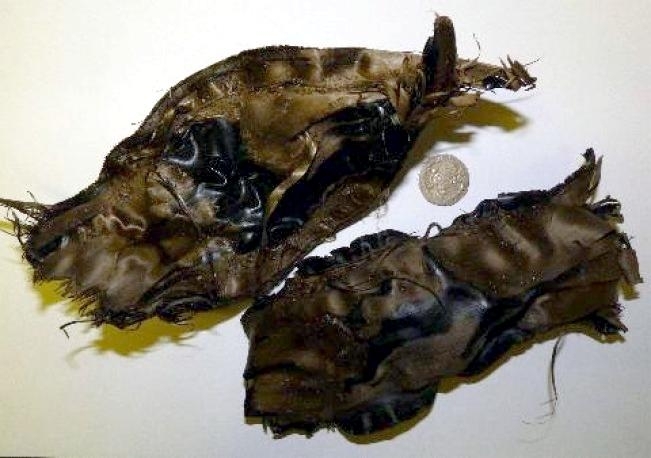 Its oblong egg cases are up to 10 inches long. 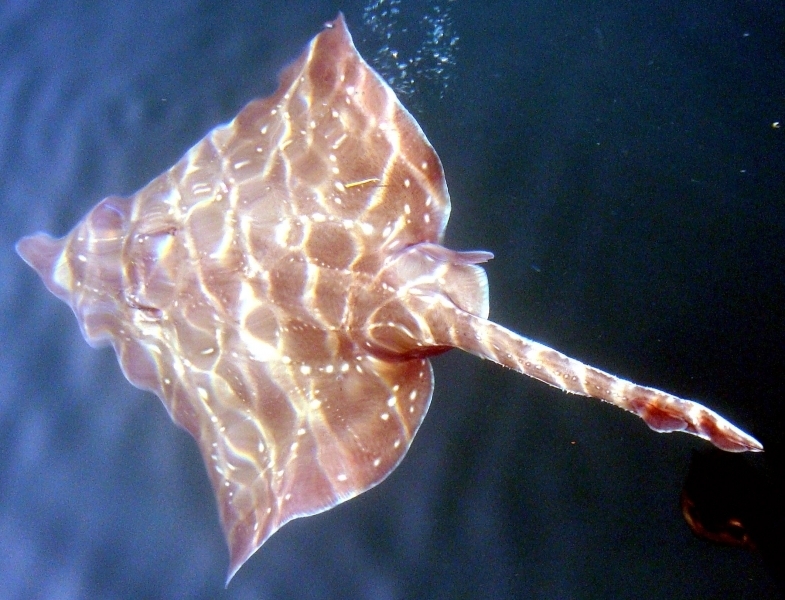 They are laid in fall or winter and hatch 2 to 5 months later. 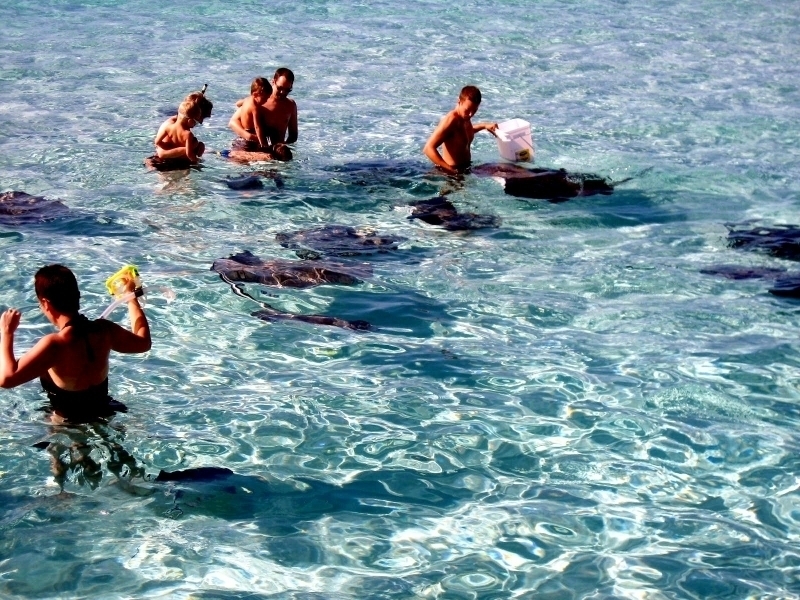 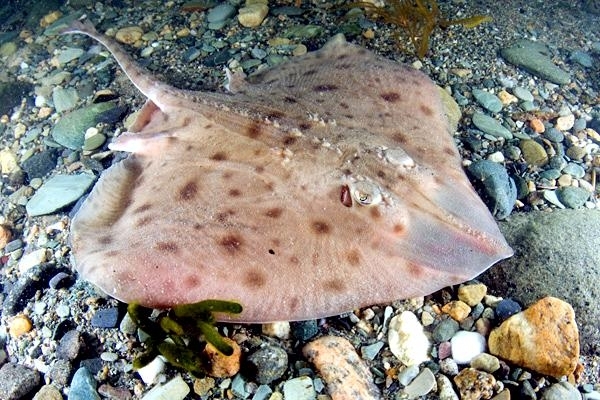 While mature Common Skates prefer deeper water, the young will spend time in shallow waters. 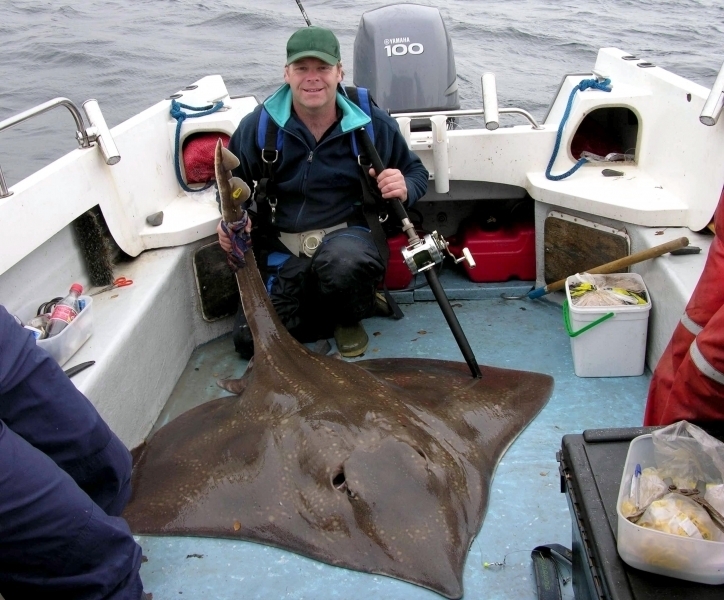 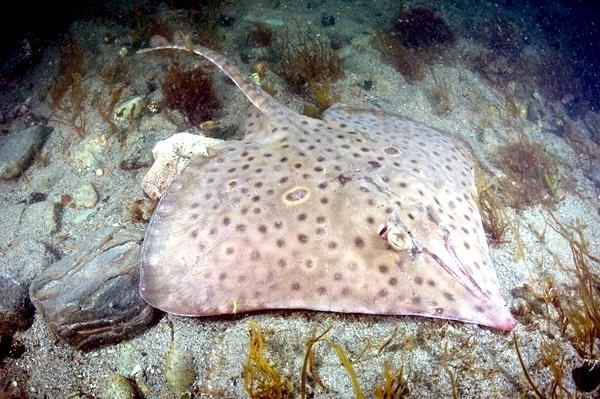 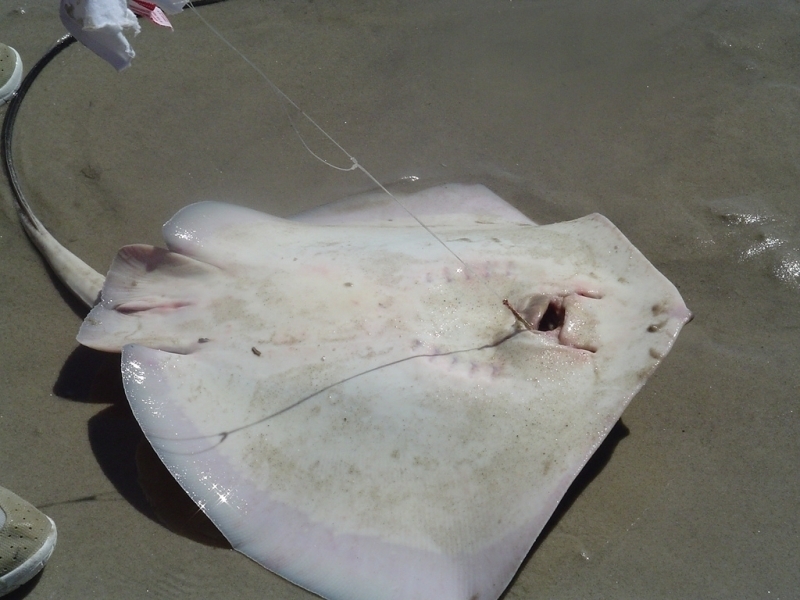 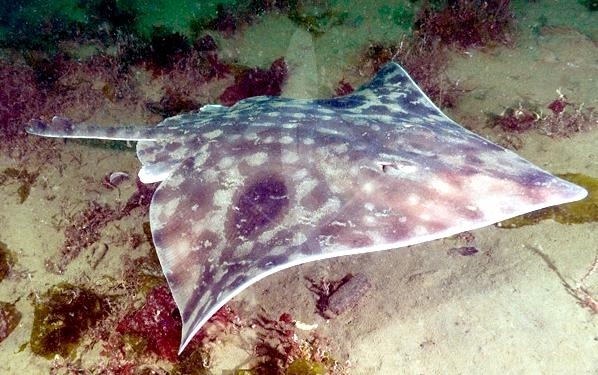 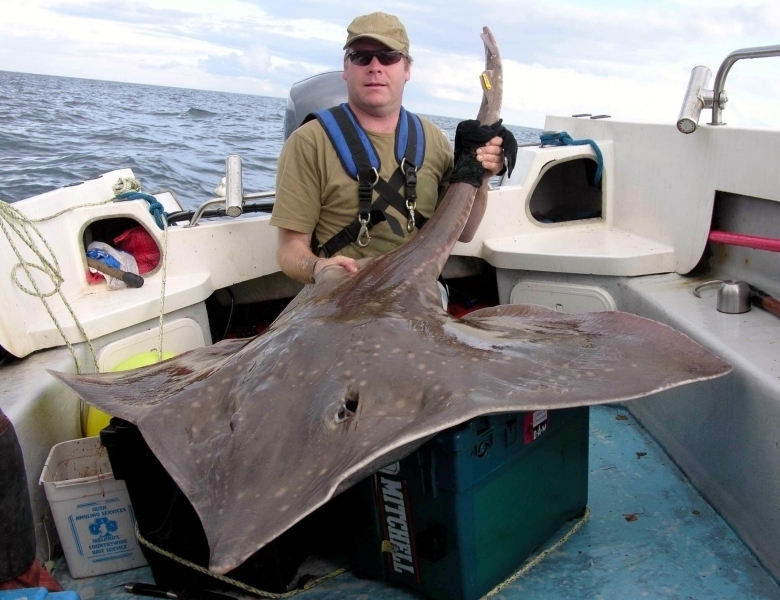 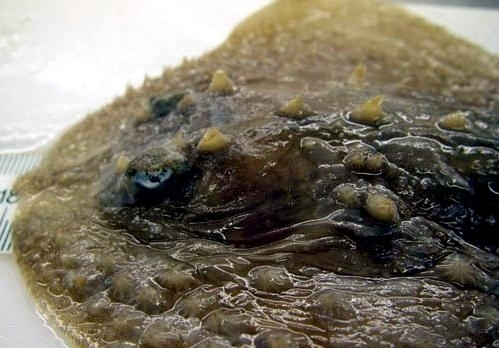 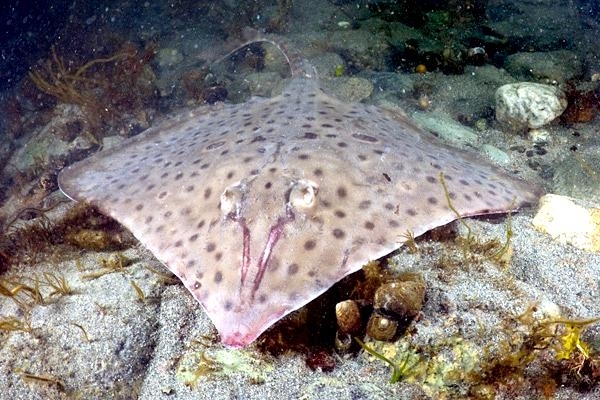 Decades of over-fishing have damaged miles of delicate seabed habitats that fish such as this rely on and the Common Skate has a very low resilience to fishing pressure which means its large body size means that it can be caught in fishing nets even from birth.